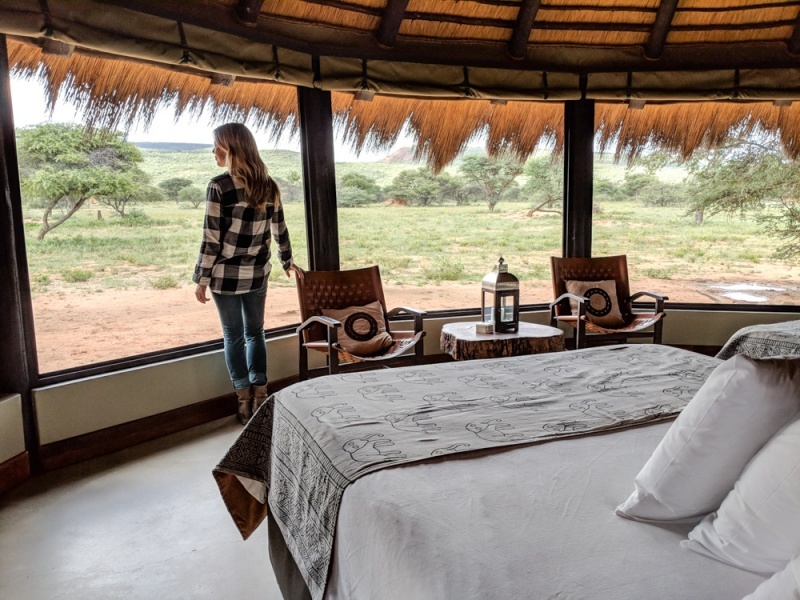 No trip to Namibia is complete without a stay in a luxurious tent camp where you can lounge in bed while wild animals graze outside your window. 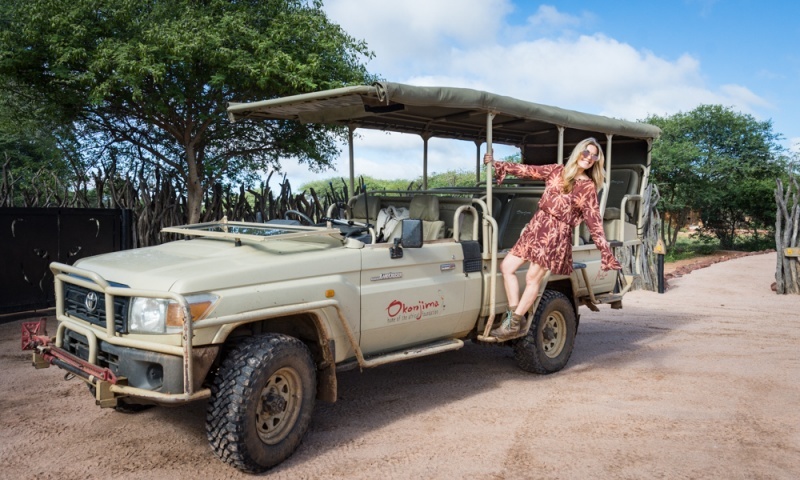 And there is no better place in the country to get your fill of luxury treatment and exhilarating safari excursions than at the Okonjima Nature Reserve. Not only does the camp provide lavish accommodations, delicious meals, and amazing excursions, but they also do wonderful work for the country through conservation and education. Okonjima is a nonprofit that is owned and managed by a passionate group of siblings, dedicating to continuing the good work that their parents started. The reserve is conveniently located just north of Windhoek and is a must-see stop along your cross-country road trip. Don’t leave Namibia before you’ve had an opportunity to visit this spectacular nature reserve! Owned by the Hanssen family for 35 years, the land of the Okonjima Nature Reserve was originally used as a cattle farm. During that time they realized the conflict that is created between farmers and cats trying to live and survive in the same place. Cats kill the livestock and farmers kill the cats to protect their investment. The reserve established the AfriCat Foundation to attempt to find solutions for the farmer/wildlife problem and over the years the property has increased in size from 6,000 hectares to 22,000 hectares. When farmers kill cheetahs to protect their livestock, often there are babies left behind to fend for themselves. They must learn to hunt and kill on their own which is no small feat for a little one. The AfriCat Foundation was created to care for these abandoned little ones and to teach them to hunt in a protected environment before releasing them back into the wild. The foundation is now focused on a long-term conservation strategy of educating the country’s youth about the benefits of large cats for the Namibian ecosystem and economy. Children are brought from all over Namibia for 4-5 days to learn all about conservation and the environment in the hope that they’ll go home and educate their parents as well. 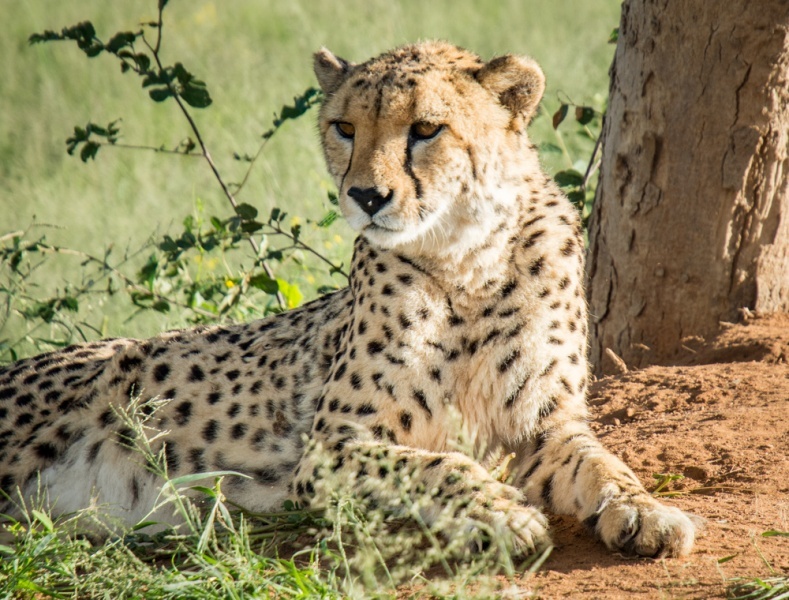 Even if you don’t make it to the Okonjima Nature Reserve for a visit, you can still help their cause of promoting the conservation and ethical treatment of Namibia’s big cats. The foundation relies on private donations to care for the animals and to run their courses for the kids. Every donation helps! 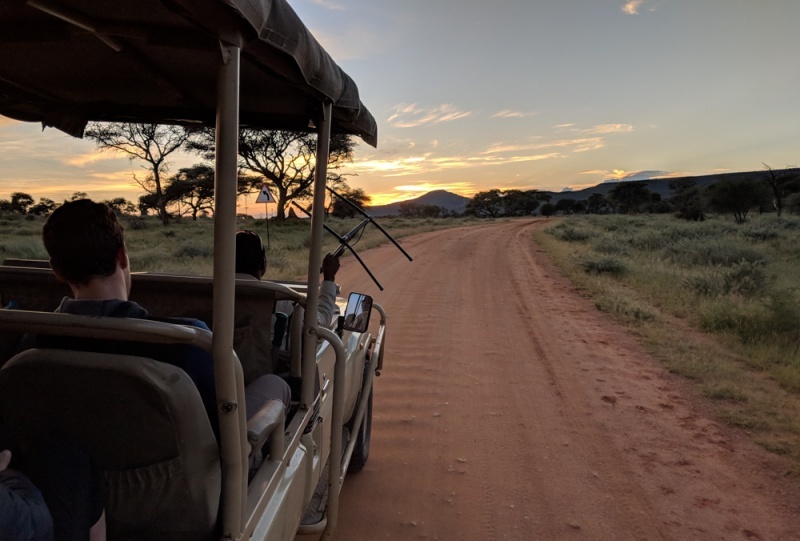 To get from the main highway to the Okonjima properties you’ll drive down a long, dirt road and through several gates that keep the animals separated for protection purposes. You’ll likely spot all kinds of wildlife near the road on your 30-minute drive. The lodges are spread out on this expansive property which allows for amazing views from every room. You’ll feel like you are right in the heart of the African bush as curious warthogs and guinea fowl approach your window to peer inside. From camping to private villas, Okonjima has several lodging options to fit every budget. The rooms are spacious and gorgeously decorated, the meals are divine, and you’ll have a wonderful opportunity to view beautiful sunsets as well as plenty of wildlife right outside of your room! The Plains Camp gives homage to Okonjima’s roots in its design. Built in a farm-style, this lodge has high ceilings and plenty of tables in the main gathering area. It’s also the only building with an aluminum roof as opposed to the thatched roofs of the bush camps. There are 30 rooms in total (14 standard, 11 view, and 5 garden rooms) at the Plains Camp. The view rooms are a bit brighter and have patios with the perfect sunset view. This lodging option is perfect for families and children. 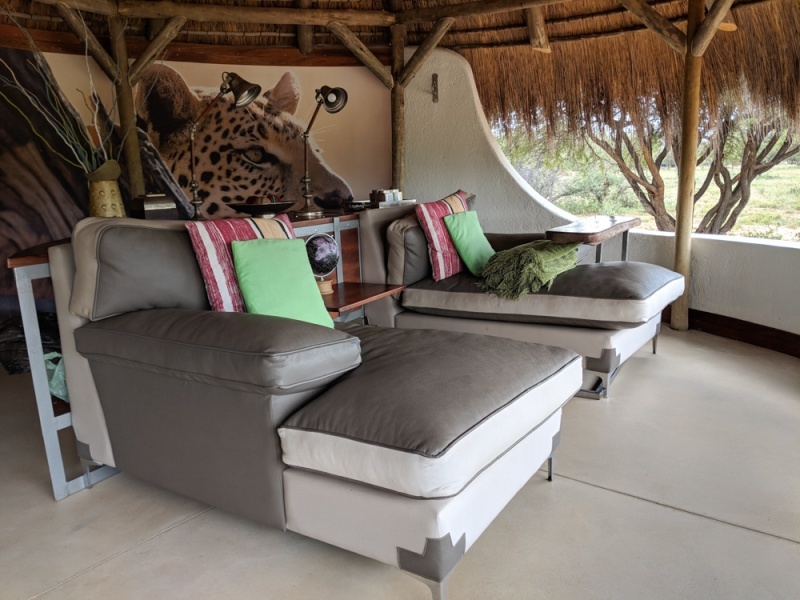 This luxurious Bush Camp is intimate enough to have plenty of privacy but also busy enough to provide you with entertainment when you want it. The 9 large rooms offer large picture windows overlooking the expansive landscape. 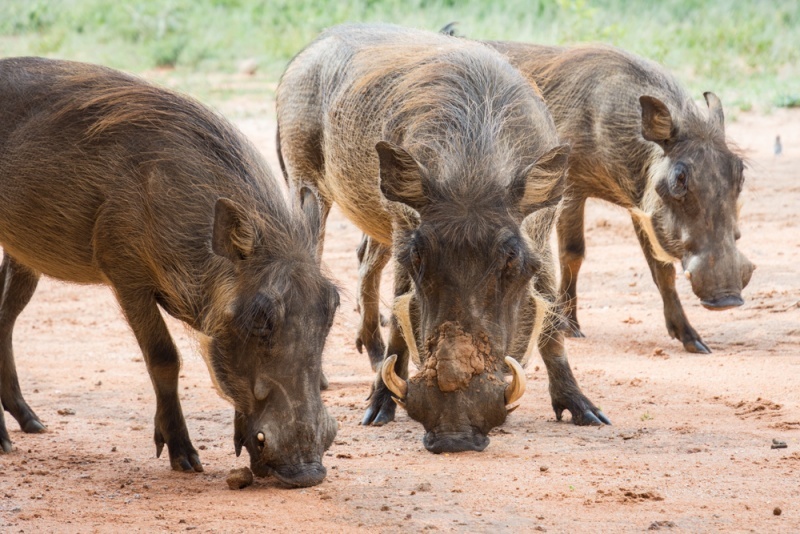 Birds and warthogs will quite literally walk right up to your window to have a look inside! You’ll also have your own open-air lounge area where you sip coffee, lounge on one of the comfortable chaises, and listen to the birds chirping nearby. The Bush Camp offers several tour options every day on a set schedule. 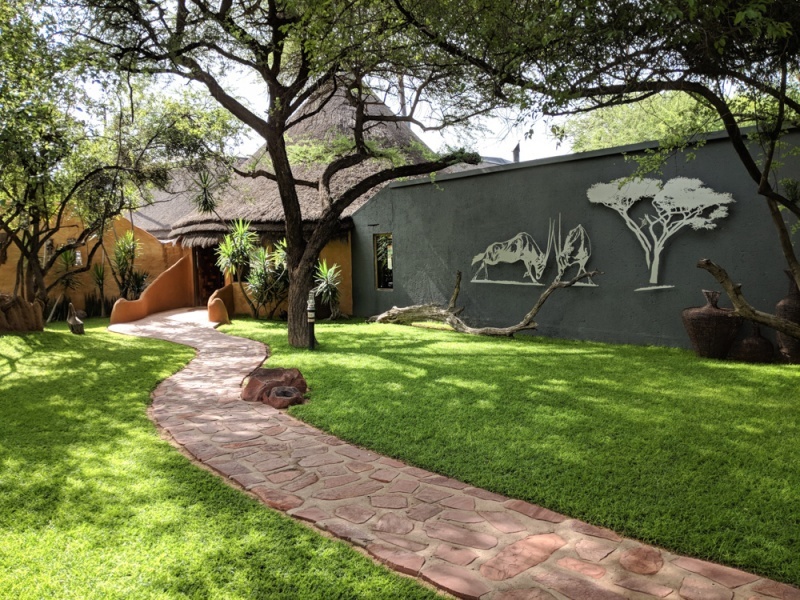 If you are looking for more flexible tour times, consider staying at the Bush Suite or Bush Villa where you can set your own schedule based on your needs. *Only kids over the age of 12 are allowed to stay at the Bush Camp. 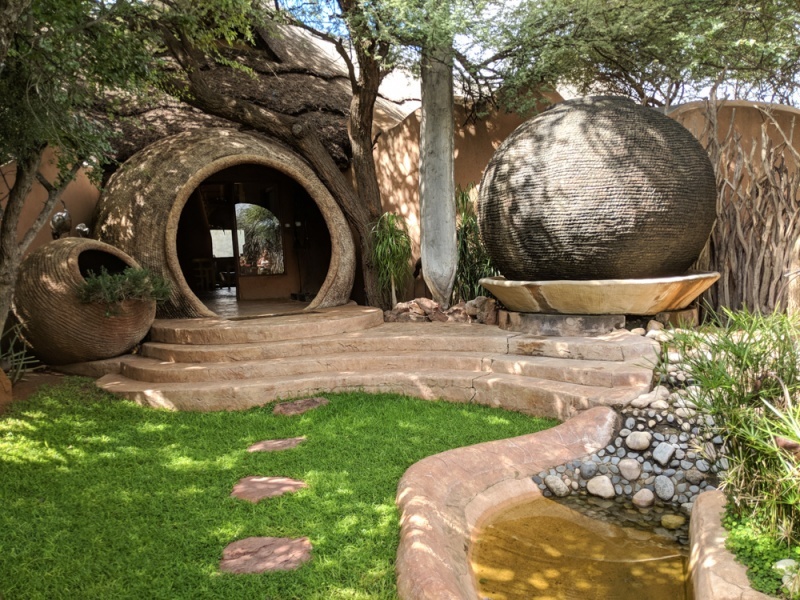 The Bush Suite is the perfect spot for friends to stay during their Namibian vacation. With 2 huge, gorgeous rooms it sleeps 4 people. This super private and lavish suite has its own guide, housekeeper, and chef for the ultimate freedom and pampering. *Only kids over the age of 12 are allowed to stay in the suite unless granted special permission. The Bush Villa is the ultimate in private luxury at Okonjima. 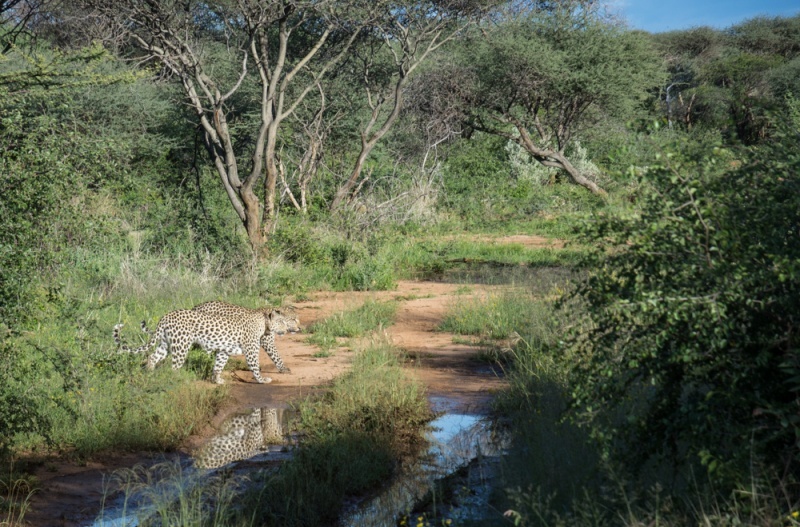 It is the only lodge on the property that is located inside of the gates where cheetahs and leopards are roaming freely. And with a watering hole right off the back patio, you’ll get the best opportunity to see wildlife from the comfort of your room. There are 4 rooms and the villa sleeps 12 people. It is a great option for families or groups. You’ll also have your own guide, housekeeper, and chef on hand that will treat you like royalty! *No kids under the age of 16. The campground is the most basic and budget of the lodging options at Okonjima. There are 4 campgrounds that have 100 sites combined and tours and meals are not included. Start your day with a sunrise cheetah track! Your knowledgeable guide will use a tracking device to attempt to find at least one of the four cheetahs that roam around the park. Once you are in the range you’ll exit the car and attempt to track the cheetah down by foot. And then you can head out in the evening in search of the leopards that prowl around the reserve. Sightings are never guaranteed of course, but if you do have the opportunity to catch sight of one it’s quite an experience! You won’t want to leave the safety of your safari vehicle but the car can get you closer than you can imagine. 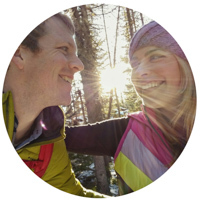 There are several self-guided, well-marked nature trails on the property. There is also the option to do a guided night walk to see several animal species feeding near the river. And you can visit the Carnivore Care Center to learn all about what the foundation is doing to help to protect the wild animals of Namibia. 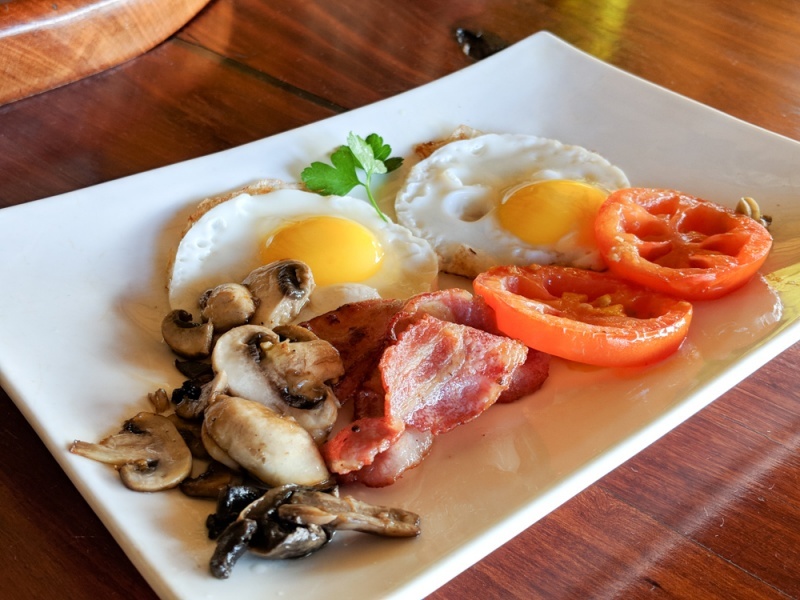 A delectable breakfast spread and multi-course dinner is included in all lodge reservations at Okonjima. Guests can also choose an all-inclusive package that includes lunch and beverages as well. Breakfast includes a selection of meats and cheeses, freshly baked pastries, yogurt with museli, and made-to-order eggs. Dinners include an appetizer, a main course of local game, and a tasty dessert. 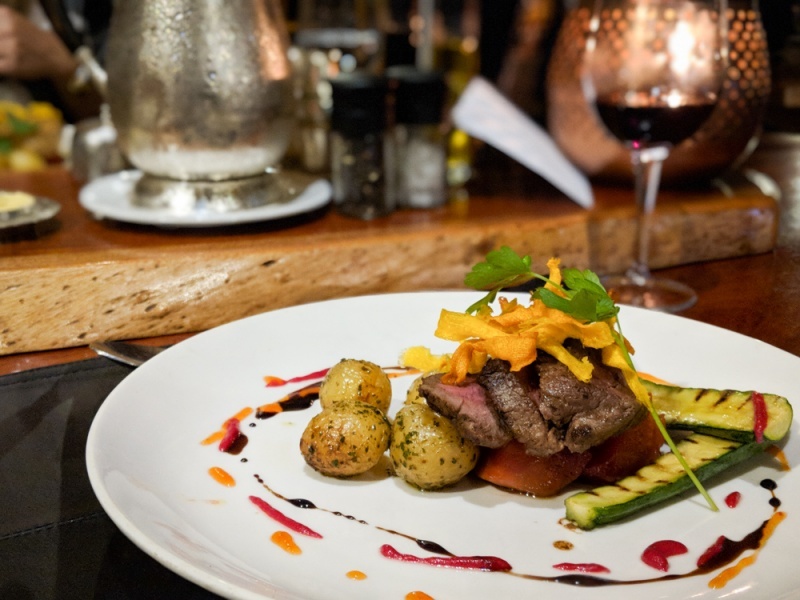 Chef Martin has been with Okonjima for over 12 years and has a passion for fresh, flavorful food. Coffee and tea are available to guests throughout the day, both in their room and in the lobby area of the lodges. The bars serve a wide selection of premium wine, beer, and spirits. Spend your evenings gathered around the fire pit while sipping delicious Namibian wine and chatting with other guests from around the globe! You’ll have a wonderful stay at the Okonjima Nature Reserve and an experience you’ll never forget! Looking for more details on what to see and do in Namibia? Check out our favorite books!